Blacky heavy vinyl. 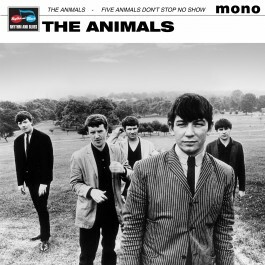 By Summer 1966, the Animals were ready to call it a day. John Steele had bailed out back in February and Nashville Teens drummer Barry Jenkins was drafted in as his replacement. The band had decided to break up in May, but they were contracted to do a lengthy American tour along with teen stars Herman’s Hermits, so the reluctant five-piece dragged themselves over to the States to fulfil the commitment. But it turned out to be a pretty eventful tour, culminating in a trip to San Francisco where Eric Burdon saw the light. There, R&B was out but Psychedelia was very definitely in. The group cut a couple of tracks in Los Angeles with Frank Zappa, one of which, The Other Side of This Life, came out as a US 45 in November after the break up. Over on the East Coast, they played a gig at New York’s Wollman Rink Central Park on August 3rd and later on that evening, Chas Chandler had a Damascene moment after seeing an obscure, unsigned guitarist by the name of Jimi Hendrix. Chandler’s days of playing bass were over. The group’s last gig was on September 5th at the Steel Pier Resort in Atlantic City and that was it for the Animals – at least, until Eric Burdon and The New Animals made their appearance.